Organization that seeks to develop an ethical marketplace where buyers and sellers can trust each other by creating a community of trustworthy businesses, setting standards for marketplace role models, and denouncing substandard marketplace behavior. The Board of Zoning Appeals (BZA) is a seven-member board that hears and decides prmarily zoning variances and temporary use permits. The Board is also responsible for the hearing and disposition of appeals from any order or decision made by a City administrative officer in enforcing the zoning ordinance. BZA meets the second Thursday of each month in City Council Chambers at 21 S. State St.
City department charged with attracting and retaining businesses in our community by making Westerville the ideal place to operate a company. After 100 years of service, the Westerville Electric Division is the only municipally owned and operated suburban electrical provider in Central Ohio, serving all Westerville's 36,000 residents and 1,500 businesses. Three fire stations strategically positioned in the City allow the Fire Division to provide 4-minute average emergency response time. Enhances the lives of Westerville citizens by providing quality and diverse leisure facilities, programs, and services, and by preserving and developing natural areas. The department maintains 550 acres with 39 parks and facilities including a 96,600 square foot Community Center and 23 miles of leisure paths and bike trails. The Planning Commission is a seven-member board that holds public hearings on land use proposals such as subdivision plans and rezoning requests. The Commission also hears and reviews plans for new office and commercial land development and provides a forum for public discussion of plans and proposed development regulations. Meetings are on the fourth Wednesday of each month in City Council Chambers at 21 S. State St. Consisting of 75 sworn officers, 20 civilian employees, and 20 reserve officers, the Westerville Police Department provides bicycle and foot patrols, commercial vehicle enforcement, selective traffic problem-area enforcement, and use of the speed monitor sign throughout the City. The Uptown Review Board (URB) is a seven-member board charged with protecting and promoting the historic character of the Uptown District. The URB is responsible for reviewing changes including new construction, building additions, facade renovations and changes to exterior materials, window and door replacements, signage, awnings, paint color changes, building demolition, and landscaping elements (e.g. fences, walls, walkways, etc.). The Board meets the first Thursday of each month at 21 S. State St. in City Council Chambers. An online databse helping entrepreneurs plan, start, and advance their businesses by maximizing their community resources. This site, developed through a collaboration between TECHColumbus, the Columbus Metropolitan Library, OCLC, and the Columbus Chamber of Commerce, provides access to a business librarian through chat and e-mail for two hours each business day. It is the mission of Genoa Township to guide and manage the development of the township in a manner than retains or enhances the quality of life of its residents. Leadership Westerville is a non-profit organization committed to creating a network of committed citizens who are dedicated to improving their leadership skills to better serve our community. Organization that educates Ohioans about the economic effects of legislative and judicial actions and prepares them to participate in the political process in an informed manner. The Ohio Chamber of Commerce is dedicated to presenting Ohio lawmakers with the business perspective on issues. As Ohio's largest and most diverse statewide business advoacay group, the Ohio Chamber has been a consistent voices for business for more than a century. 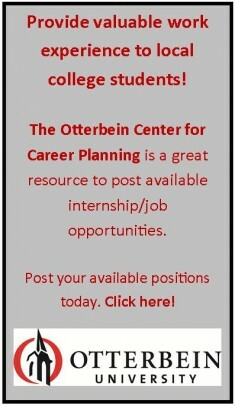 Otterbein University is a nationally ranked, comprehensive institution with a liberal arts tradition dating back to 1847. An emphasis on community engagement and service learning in 56 undergraduate and three graduate programs create endless opportunities. Organization seeks to accelerate business growth and job creation by facilitating collaboration between Central Ohio's technical assets and providing resources and assistance as needed to encourage business and overall economic progress. As the voice of business, the Chamber's core purpose is to fight for free enterprise before Congress, the White House, regulatory agencies, the courts, the court of public opinion, and governments around the world. Serving a culturally and economically diverse 52-square-mile area in northeastern Franklin and South Delaware counties, Westerville City Schools serves approximately 14,250 students, is the 10th largest district in Ohio and earned a rating of 'Excellent' from the Ohio Department of Education on the most recent State Report Card. Non-profit organization set up to construct a memorial in an effort to provide a unique and thoughful look into the lives of firefighters. The Westerville Public Library provides materials, programs and services to residents of all ages in Franklin and Delaware counties to assist in their pursuit of information and resources to meet their educational, professional and personal needs. This site is devoted to promoting the businesses and events of Uptown Westerville. Here you will find information on all your favorite Uptown shops and restaurants along with details about upcoming festivities to occur in Westerville's historic district. Organization that promotes tourism and attracts visitors to the Westerville area. Provides information on what to see, things to do, and where to stay in the Westerville area.